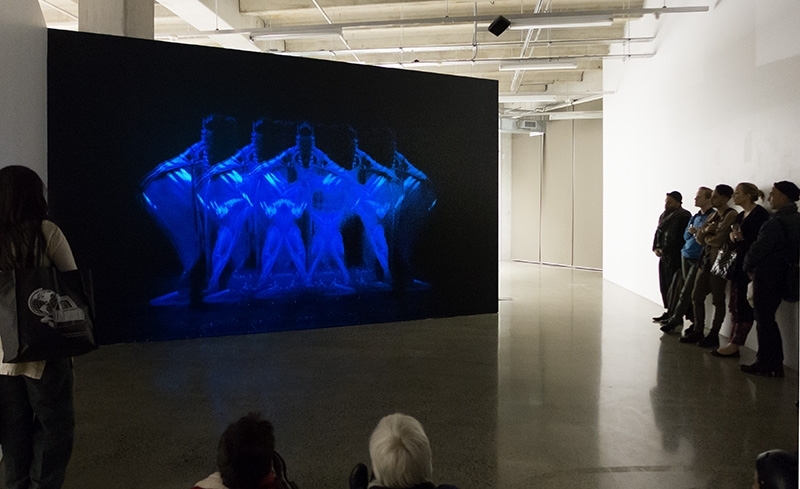 I wrote a short text to accompany Fāgogo, the very impressive first solo exhibition of Sāmoan lens-based artist, Pati Solomona Tyrell at ST PAUL St Gallery (8 June – 21 July 2017). For the first time, my writing was also translated into Te Reo Māori, and that makes me so happy! Pati is featured in the third #PIMPIWinterSeries exhibition, Lovers Rock opening 29 July at Lime Espresso Bar & Eatery in Ōtāhuhu, South Auckland. The theme of this year’s national Vaiaso o le Gagana Sāmoa (Sāmoan Language Week) was Ma’au i lou ofaga. Maua’a lou fa’asinomaga – Keep your identity alive to thrive. It’s the one week in the year that Sāmoan language, culture, imagery and pride punctuate everyday life, particularly for Pacific people, those who engage with Pacific people, and in and around Pacific spaces. Other weeks of the year, Sāmoan language and culture take their place on the margins of New Zealand society, although due to size and scale of the resident population, relatively closer to the centre than other Pacific languages and cultures. For Sāmoans, and other Pacific peoples who enjoy a dedicated national language appreciation week in New Zealand, keeping our unique, increasingly complicated, and diasporically disjointed identities alive, and thriving, is a challenge that is faced 365 days a year. Pati Solomona Tyrell has approached the concept of fāgogo, the practice, context and content of Sāmoan fables, as the foundation of his debut solo exhibition. Through the sharing and validation of oral histories, collective belief systems and behaviours, fāgogo configures the connection between individuals to their past, and to the realm of super humans, ancestors and deities. The practice emphasises the roles and responsibilities of Sāmoans and the transmission of knowledge and knowing, to the continuum of the Sāmoan world. In diaspora, a world where fāgogo and the transmission of indigenous knowledge are relegated to decontextualised, antiquated, mythological or academically cited practices, we learn that our past is disjointed from our present. In diaspora, the enduring effects of cultural and spiritual colonisation take form in our health and wellbeing, our communities and perceptions of self. We learn from our collective behaviours, shaped by our environments, economics and systems of education. In diaspora, the identities of Sāmoans and other Pacific Islanders have been mixed and mashed, chopped and screwed. We learn about being ‘enough’ and not enough, of identity as compartmentalised, as the sum and absence of parts. In the context of mainstream New Zealand, the presence of Pacific Islanders is often barely visible. We learn repeatedly that our presence is excluded, marginalised, silenced or misunderstood. When fāgogo and practices that centralise indigenous knowledge are performed, in homes and safe spaces, in language and ritual, the continuum of indigenous knowledge unfolds, carefully, vulnerably, intentionally. It is not photographs on walls, it is more than lighting and equipment, it is not talent and direction. Fāgogo wakes up the intrinsic presence of our ancestors in our bones. Tyrell has assembled an archive of portraits that command audiences, the art world, students and educators to hear the call: it repeats – presence, visibility, pride, knowing. Presence, visibility, strength, mana. Presence, visibility, respect, talanoa. This exhibition is an intervention. Beyond being just sitting subjects, Tyrell’s community, representing the fullness of the spectrum of gender, sexuality and belonging, are present as collaborative, conscious partners. The moment captured amongst racial, cultural, professional and playful tensions is the act of being seen. These portraits are configured around the creation of dedicated space for the physical presence and facilitation of visibility, for talanoa and the brokering of knowledge transmission. In this, Tyrell’s rich and ambitious public programme is central to the activation of the exhibition’s thematic context. In the current zeitgeist, the thirst for diversity and otherness in the arts is palpable; visibility of Pacific art and artists is increasingly evident in programming for public galleries and museums. New territories have formed where negotiated power and presence also expose the systemic inequalities and neglect that diverse artists and audiences have historically experienced. But this exhibition and its consciously crafted facilitation of presence is an oasis of glorious brown self-love, a safe space, a fully charged dreamscape of power and presence, a proud portal to motherlands, other lands and Pulotu. Ko te kaupapa o Vaiaso o le Gagana Sāmoa (Te Wiki o te Reo Hāmoa) ā-motu i tēnei tau ko Ma’au i lou ofaga. Maua’a lou fa’asinomaga – Kia ora tō tuakiri e ora nui ai koe. Koinei te wiki kotahi i te tau e whai wāhi nui ai ki ngā mahi o ia rā, ko te reo, ko te ahurea, ko ngā tohu Hāmoa hoki, tae atu rā anō ki te tū whakahī hei Hāmoa. He pēnei pū mā ngā uri o Te Moana-nui-a-Kiwa, mā te hunga mahi tahi ki ngā uri nei, ā, tae atu anō ki ngā wāhi e noho nei hei wāhi motuhake ki ngā uri o Te Moana-nui-a-Kiwa. I wiki kē atu o te tau, ka whai wāhi noa te reo me te ahurea o Hāmoa ki ngā tahataha o te porihanga o Aotearoa, heoi anō, nā runga i te rahi me te whānui o te horapa o ngā uri Hāmoa kei konei e noho ana, he kaha ake te rangona, tērā i ētahi atu reo, ahurea hoki o Te Moana-nui-a-Kiwa. Ki ngā uri o Hāmoa, ki ngā uri o Te Moana-nui-a-Kiwa kē atu kua whai i tētahi wiki motuhake i Aotearoa hei whakanui i ō rātou reo, he wero nui te whai kia ora, otirā, kia ora nui ai ō tātou tuakiri motuhake, matatini, nakunaku anō, ā, he wero e rangona ana i ia rā o ia tau. Kua whakatau a Pati Solomona Tyrell, ko te kaupapa o te fāgogo, arā, ko ngā tikanga, ko te horopaki, ko te kiko anō o ngā pūrākau Hāmoa, hei tūāpapa mō tana whakakitenga takitahi tuatahi rawa. Mā te tuku me te whakamana i ngā tāhuhu kōrero ā-waha, i ngā whakapono me ngā whanonga ā-iwi, ka hua i te fāgogo he hononga i waenga i te tangata me tōna nanahi, otirā, me te wāhi ngaro, arā, te wāhi e tau nei ngā tipua, ngā tūpuna me ngā atua anō. Ka whakaūngia e te tikanga nei te mana nui o ngā tūnga me ngā kawenga o te Hāmoa, o te tukuhanga o te mātauranga me te mōhio anō, ki te oranga tonutanga o te ao Hāmoa. I te ao e noho wewehe nei ngā uri i ō rātou kāinga tūturu, he ao e whakaitihia ai te fāgogo me te tukuhanga o ngā mātauranga taketake hei tikanga horopaki-kore, hei mea hanga tawhito noa, hei pakiwaitara waihanga noa, hei tikanga kōrero mā te hunga pūmātauranga noa, ka ako tātou, kāore he hononga i waenga i tō tātou nanahi me tō tātou nāianei. I te ao e noho wewehe nei ngā uri i ō rātou kāinga tūturu, ka kitea ngā hua auroa o te tāmitanga ā-ahurea, ā-wairua anō ki tō tātou hauora, ki ō tātou hapori, ki ō tātou tirohanga ki a tātou anō. Ka ako tātou i ā tātou whanonga ā-iwi, he mea auaha e ō tātou taiao, e ngā tikanga ōhanga, e ngā pūnaha mātauranga hoki. I te ao e noho wewehe nei ngā uri i ō rātou kāinga tūturu, ko te tuakiri o te Hāmoa me uri kē o Te Moana-nui-a-Kiwa kua whakahanumitia, kua kopenua, kua wāhia, kua kōwiria. Ka ako tātou mō te ‘nawhe’ me te kore rānei i nawhe, ka ako anō mō te tuakiri hei mea e taea ana te wehewehe ki ētahi wāhanga motuhake, hei tapeke, hei mea tatau. I te horopaki o Aotearoa auraki, he nui tonu ngā wā me uaua ka rangona te awenga o ngā uri o Te Moana-nui-a-Kiwa. Hoki atu, hoki atu tātou e ako ana, ko tō tātou mana ka mahue, ka takahia, ka whakangūtia, ka pōhēhētia rānei. Ka whakatinanatia ana te fāgogo me ētahi atu tikanga e whakamana ana i ngā mātauranga taketake, ki roto i ngā kāinga me ngā wāhi haumaru, i roto i te reo, e ai anō ki ngā kawa, ka tukuna tonutia te mātauranga taketake i runga i te whakatonu, i te whakaraerae, i te takune anō. Ehara noa i te whakaahua ki runga pakitara, i ngā rama me ngā taputapu, i ngā pūkenga me ngā tohutohu. Ko tā te fāgogo he whakaoreore i te mana o ō tātou tūpuna kei ō tātou iwi tonu e tau ana. Kua whakaemihia e Tyrell he kohinga whakaahua e whakahau nei i te whakaminenga, i te ao toi, i te ākonga, i te kaiako anō, kia rangona ai te karanga: ka tōaitia – te awenga, te kitenga, te whakahī, te mātau. Te awenga, te kitenga, te kaha, te mana. Te awenga, te kitenga, te whakaute, te talanoa. I tua noa i te noho hei kaupapa whakaahua, ko te hapori o Tyrell, he mea whakatinana i te whānuitanga o ngā momo ira tangata, o te hōkakatanga me te whai wāhitanga, kua whai tūranga hei hoa mahi ngātahi, mōhio anō. Ko te wā i kapohia ake i waenga i ētahi whakatete ā-kiri, ā-ahurea, ahakoa ngaio mai, ngahau mai anō, ko te kitenga tonu. Kua whakaaturia ēnei whakaahua e ai ki te whakaritenga o tētahi wāhi motuhake e whakatinanatia ai, e ākina anō ai te kitenga, te talanoa, otirā, te tukuhanga o te mātauranga. Nā runga i tēnei, ko te hōtaka tūmatanui rangatira, awhero nui anō a Tyrell kei te matū o te whakatinanatanga o te kaupapa matua o tēnei whakakitenga. E ai ki te hā o te wā nei, e kaha rangona ana te hiakai nui ki tēnei mea ki te kanorau, ki te rerekē anō i te ao toi; e kaha haere ana te kitea o ngā toi me ngā ringatoi o Te Moana-nui-a-Kiwa ki ngā hōtaka a ngā whare toi me ngā whare pupuri taonga. Kua hua ake he taumata hou, ki reira huraina ai e ngā whiriwhiringa mana ngā pēhitanga me ngā whakahapatanga kua rangona e ngā ringatoi me ngā whakaminenga kanorau i mua. Heoi anō, ko tēnei whakakitenga, me te āhua i āta whakaritea ai te awenga me te mana, e noho nei hei āhuru mōwai e whakanui nei, e whakamana nei i te kiri parauri, he wāhi haumaru, he whenua moemoeā e rangona ai te mana me te awenga, otirā, he ara whakahī ki te kāinga tūturu, ki whenua kē, ki Pulotu rā anō.